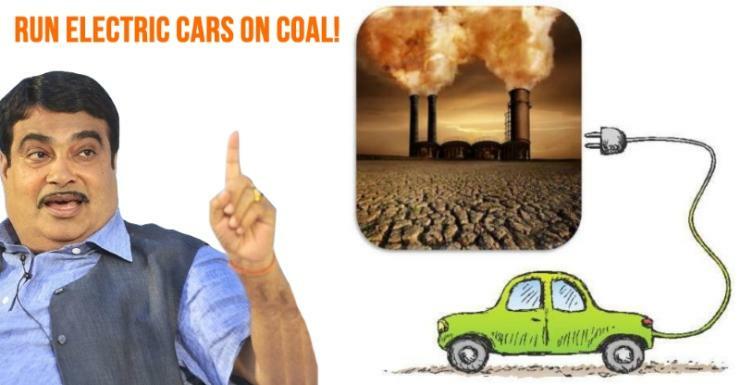 The minister for road transport and highways, Nitin Gadkari, now wants automakers in India to use the’ cheap power generated here by coal to be used to run electric cars’. He also said that India is a power surplus country, and this extra power should be used to run cars on battery power. We are not against any automobile industry. We export about Rs 1.5 lakh crore (worth of automobiles). It (the auto industry) has got highest employment potential. I told them (auto makers) to continue exports. But pollution is a big concern. You give priority to indigenous technology. Now India is coal and power surplus country. It is very cheap. People will also be benefitted. Give priority to this. You venture into public transportation using electricity. Coal is considered to be one of the dirtiest, and most inefficient forms of electricity generation. Thermal power plants that use vast quantities of coal – a finite natural resource – to produce electricity. While doing so, they cause considerable air pollution and also other forms of pollution due to coal mining. Other forms of power generation including nuclear, wind and hydro-electric, are said to be much less polluting than coal. So, Mr. Gadkari’s idea that using coal to generate electricity for electric cars may actually cause more pollution than fighting it. India needs to move to power generation from renewable sources if it seeks to reduce pollution caused due to automotive emissions. Using coal for power generation would only transfer the pollution problem, from automobile exhausts to power station chimneys. In the recent past, Gadkari has asked the automakers in India to move to electric cars before 2030. Automakers for their part, want the government to set up electric charging infrastructure, currently nearly non-existent in India. The government has plans of setting up a large number of electric charging stations across the country. Soon, it will also acquire nearly 10,000 electric cars to reduce the government’s dependence on petrol and diesel powered vehicles.